We offer exclusive, high end tours with a customized fleet of transportation. You will be comfortably sightseeing the beauty of the island without worrying about heat aind humidity or the possibility to ride all day long in a small, compact vehicle. Just as every other product we offer, our Pearl Harbor Tour can also be customized according to your own personal preferences. The tour can accomodate up to 12 passengers, however, for parties of 5 or more additional fees will apply. It will typically last 2.5 to 3 hours. You will dive into the history of the WWII, see a 30 minute long documentary of the Pearl Harbor attack from 1941, see two museums with short videos and many photographs of the horrific reality that stroke USS battle ships on that day, and take the short trip with a ferry to the Arizona memorial - monument constructed on the top of the battle ship Arizona. We always offers the most exclusive experiences of touring the island of Oahu! You will be picked up from your hotel and driven by one of the MSH professional drivers to Pearl Harbor. Tickets to all attractions visited are included in the package priice. You will be then taken back to the history of the WWII with a visit to the Arizona Memorial where 1,741 of the boat’s crew lost their lives on December 7, 1941. 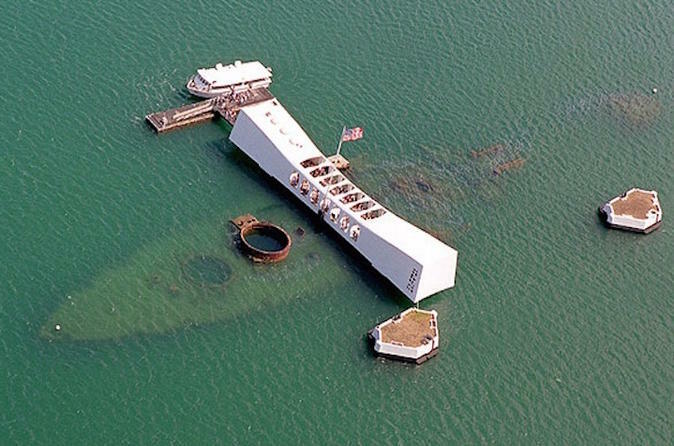 This national monument is currently over the submerged remnants of the original ship from the WWII. You will get to spend time in the museum and sink in the military environment of the harbor. Our guide will provide you with any additional information that you may need and whenever you are ready to depart will take you back to your hotel in Honolulu. Tours can be booked for the period of 9 am to 2 pm. The minimum parties for a single booking is 2 although we are capable of organizing a tour for up to 12 adults if needed. We always strives to deliver the best services, products and experiences in the tourist industry of Oahu.